Bradley A. Stout | Adams Jones Law Firm, P.A. Brad has been involved in the condemnation of several hundred tracts of land. 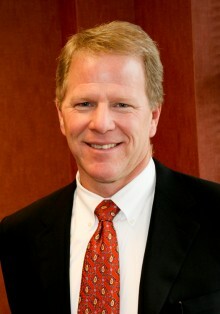 Brad has represented landowners across the state of Kansas and against all manner of agencies seeking to take property. His experience in condemnation issues extends to all varieties of property, including commercial, residential, oil and gas interests. Before focusing his practice on representing property owners, Brad advised the State of Kansas Department of Transportation, the cities of Kingman and Syracuse, Kansas, Whitewater River Watershed Joint District No. 22 and other local instrumentalities with regard to police power regulation. In addition, with respect to complex issues involving the condemnation of oil and gas interests, Brad has acted as special counsel to the City of Belle Plaine and advised counsel for the City of El Dorado. In addition to the condemnation practice, Brad is involved in all manner of real estate litigation, including property tax appeals. Brad appears several times a year before the Kansas Court of Tax Appeals on behalf of taxpayers.